"It's become already the most destructive and most costly insect ever to invade North America." An iconic American tree is facing an extinction-level threat in the form of an iridescent green beetle called the emerald ash borer, which is devastating ash trees in forests and cities across much of the United States. The ash borer, a native to East Asia smaller than the diameter of a penny, was first spotted in North America in 2002 in Michigan, suspected of arriving via imported wood-packaging material. Since then it has firmly established its calamitous impact on the country's tree stock. The beetle has now spread through nearly the entire Midwest, East Coast, and South, confirmed in 30 states and two Canadian provinces as of the spring of 2017. While individual trees can be treated by injecting a pesticide, so far there are no answers to stop the overall march of destruction. The borer has already killed more than 100 million ash trees, and virtually the entire national stock of 8 billion is at risk over the next decade. The consequences of the infestation range from the mundane (no more ash baseball bats!) to the existential (one step closer to ecological homogeneity!). Adult ash borers live off the leaves of ash trees, but the real damage is done when they lay their eggs underneath the bark. When the eggs hatch, hungry larvae go to work burrowing through the tree's circulatory system where water and nutrients are transported through the trunk. "They eat their way through the cambium layer and destroy the connections," says Robert Adams, the TreeVitalize Watersheds regional manager for the Pennsylvania Horticultural Society. "It cuts the tree off from water and eventually kills it." Since the borer is not native to North America, it faces few local impediments. "Woodpeckers will go after it, but by the time they realize it's there, it's already all over the tree," Adams says. "In terms of local predator insects to keep it in check, there aren't any." In southeast Michigan, where the borer started its journey of annihilation, barely any ash trees are left alive. Regions where the pest has arrived more recently are bracing for the dieoff sure to follow, and arborists, homeowners, and municipal parks departments across the country are scrambling to address the threat. Ash trees quickly become brittle after they die, so it is both cheaper and safer to cut them down while still alive if they are too infested for treatment. Jeffrey Iles, professor and chair of the Department of Horticulture at Iowa State University in Ames, says the borer first hit central Iowa in 2010. "We have a lot of ash out here," he says. "When you have huge populations of trees susceptible, you have a major problem on your hands. "A lot of the cities in Iowa have decided to treat some trees, take others down, and ride the rapids with others," Iles says. "It's all about managing the tidal wave that's sure to come." In Philadelphia, the ash borer was spotted within city limits for the first time in 2016. The city has been planning for its arrival since 2012 and is taking a preemptive approach. "I think it's smart to get ahead of it as much as we can," says Curtis Helm, a project manager at Philadelphia's Parks and Recreation department. "The insect can reproduce exponentially once it's in an area and trees start to collapse all at once." Helm led a team that identified ash trees located close to roads and trails, gathering points and other places where they could pose a danger to humans. They have started treating 1,500 trees ranked as high value and removed another 600 deemed unworthy of investment. The scale of the effort is illustrative of the sheer intractability of the threat. Even with plenty of warning and dedicated resources, Philadelphia expects to save fewer than 1 percent of its estimated 207,000 ash trees. "I would guess in ten years, most of our ash trees will be gone," Helm says. "It's a tremendous aesthetic and emotional loss." "It's become already the most destructive and most costly insect ever to invade North America," says Deborah McCullough, a professor in the Department of Entomology at Michigan State University. The economic cost to treat or remove trees in cities alone is in the billions, to say nothing of the unknown ecological damage from eliminating a key part of our forests. Fortunately, all hope for the ash isn't lost yet. Once the first wave of borers has passed, surviving trees have an opportunity to live on and repopulate. Remaining ash stands won't be dense enough to support such large numbers of borers, and predators will hopefully be more attuned to the beetles by then, controlling their population in the future. "The long-term question is whether ash will continue to be a functional part of the ecosystem in some areas," McCullough says. "What will happen with younger trees remains to be seen." 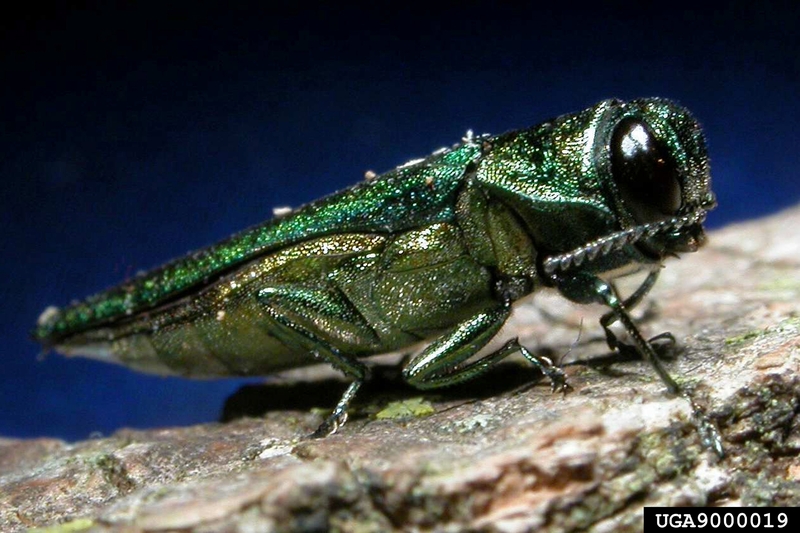 As it marches its way across the country, the ash borer provides the most extreme example yet of the ongoing influx of foreign threats to native flora. The chestnut blight, a fungus originally from Japan, killed some 4 billion American chestnut trees in the first half of the 20th century, nearly eradicating a signature species that previously dominated hardwood forests in the eastern part of the country. Next, Dutch elm disease, a fungus also believed to have originated in Asia, took out the majority of American elm trees in the middle part of the century. The loss of the elm left a void in cities and towns, where it was popular as a street tree. Many municipalities planted monocultures of ash in its place, McCullough notes, creating a perfect environment for the ash borer to thrive. The silver lining to the plague is the opportunity to strengthen and diversify urban forests, making them more resilient to the next invader. And the next one is almost sure to come. Even with stronger regulations and increased scrutiny of imports, says McCullough, there is so much movement of humans and goods between continents that it's only a matter of time before another major attack hits, be it an outbreak of a fungus, bacteria or insect we've already identified or an unknown peril lurking in a shipping container. "I don't know if we'll ever be able to keep up," McCullough says. "We could end up with something as bad as the emerald ash borer again in next 20 years."